Beautiful example of this stylish sports cruiser. Built 2000, commissioned 2001. White hull, teak decks, bow thruster, generator, air condioning, watermaker, tender garage. Sleeps 6 guests and one crew, master cabin and VIP cabin en-suite, guest/day heads. Spacious saloon with leather upholstery, refurbished throughout. Many extras over standard, plus a JetRib and a Jet Ski. 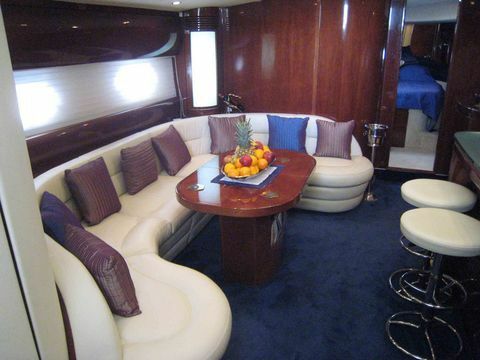 Ideal for comfort Med cruising. Very well maintained, low hours. 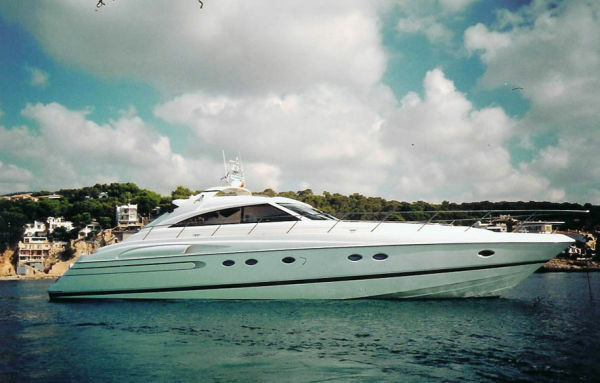 PRINCESS V65, built 2000, commissioned 2001. All GRP with teak decks, white hull. 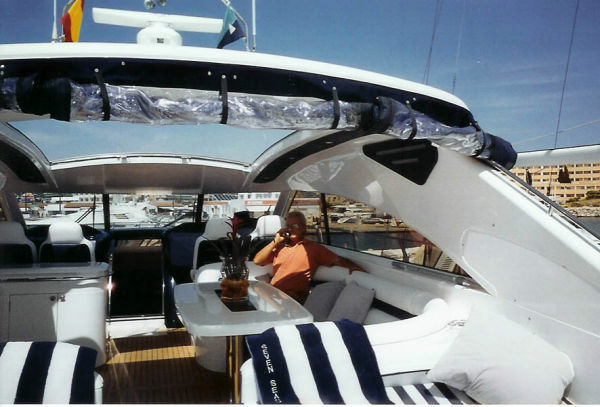 Two tender garages, transom door from aft deck to bathing platform. Electric sliding soft roof over cockpit. Twin MAN 1,200hp diesel engines. Engine hours of 1,000 hours at 08/18. Sleeps 6 guests and one crew. 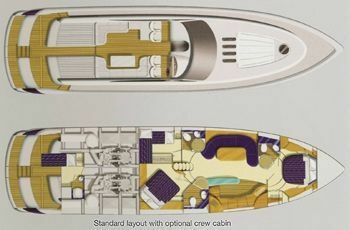 Master cabin midships with large double and en-suite. VIP cabin forward with central double, en-suite. Third cabin with twin singles, guest/day heads. 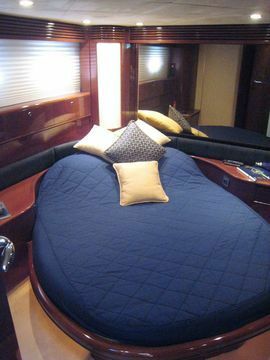 Crew cabin aft accessed from aft deck. Aft of the crew quarters is a utility area with laundry equipment and a work bench. 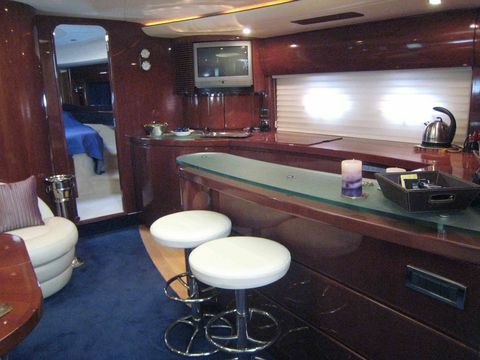 Spacious saloon with seating to port with table and galley and storage units to starboard. Leather upholstery 2010. 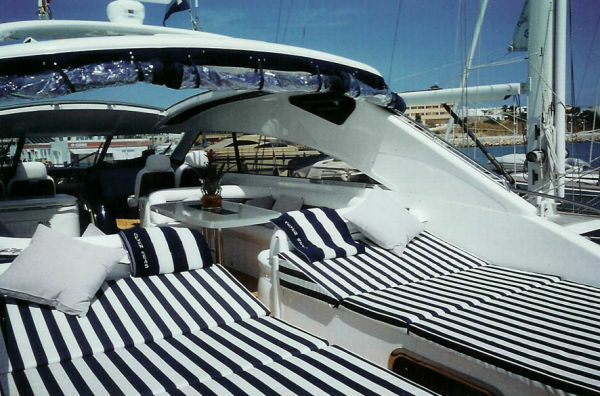 Steps up to large cockpit area with seating and table, helm, and sunbathing cushions. Access to bathing platform and side decks. In immaculate order. 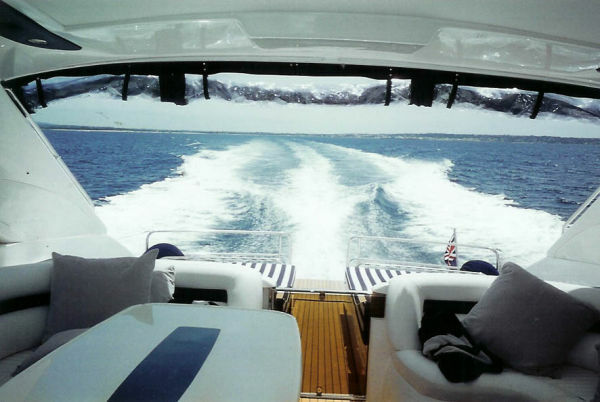 The current (second owner) keeps the yacht to a very high standard, with regular updates. In immaculate order. The current (second owner) refurbished throughout in 2003, and interior refurbished again in 2014/15. If you would like more information about this Princess V65, please get in touch using the contact details below, or alternatively by using the contact form on the right.